Today was my longest run since I began training. The furthest I made when training for a full marathon in July was 10 miles. I hit that mileage last Saturday. Today was the next step – an 11 miler. Usually I would think that an extra mile would not be that big of a deal, but I guess with what all I have on my plate right now, it was a bit more of an undertaking for me. So help me, I think about blogging most every day, but everything seems to leap forward and prevent me from sitting down and focusing on writing something. I’m still training, and doing very well actually. I won’t try to post every single map of my training runs over the past weeks, but I will post the latest long run map, because honestly it rocked. Saturday I set out to do a 7-miler. On the weekend I do one long run, usually a mile more than the previous weekend’s run. Last Saturday I did just over 6 miles, so naturally I needed to up it to a 7-miler – capiche? I set forth on my little running adventure. The night before I mapped it out, and sent the navigation notes to my iPhone, so I could quickly check them, so as to avoid getting lost. As the running routes increase in distance, so does my chance of running in unfamiliar territory. I can no longer circle the neighborhood, because at this distance it would get boring and dizzy. This new route had me getting to the Houston street bridge, but not crossing into downtown. Yeah, I crossed it; but only 80% of the way. It was fun to run over the river – well the dried up version of a river that we have here in Dallas. I had ridden over this bridge MANY MANY times on my bike, but running it was more fun. I could take the time to see the marshy area below, and the cranes that were flying around. I got right to the point that it enters the downtown area, and turned back. I know how I am about getting caught up in the running adventure, and I didn’t want to risk over doing the mileage so much that I re-visit the foot injury that I just finally healed from. Oh yeah the foot issue – I ran this without the need of taping and wrapping the arch. How about that? Ha! 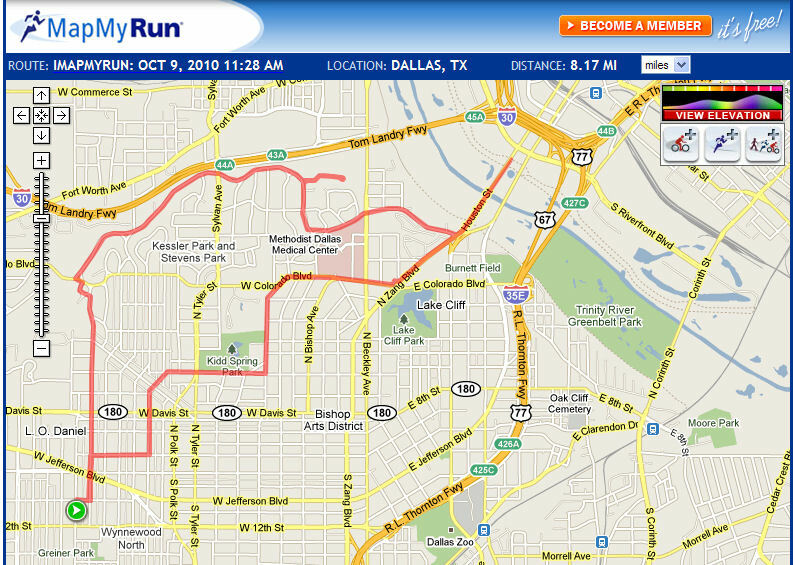 Distance 8.16 mi, Duration 1:39:24, Pace 12:15 min/mile, Speed 4.9 mph. This week begins week 5 of my training. I have cut back the mileage a little, so I can give my body a recovery week, but also so I can run the Komen Race for the Cure 5K on Saturday. I’ve ran 5K upwards of four times a week since March, but I have never ran an actual 5K Event. I’ve always admired the runners at the Komen 5K, but I have always just walked it. Each time I participated, I thought to myself, “Next year I’m gonna run this”, but I never did – until NOW.